Pawhuska, the Osage capital, with a population of more than six thousand—seemed like fevered visions. The streets clamored with cowboys, fortune seekers, bootleggers, soothsayers, medicine men, outlaws, U.S. marshals, New York financiers, and oil magnates." There's a story in Oklahoma that has been mostly forgotten, that is if it was ever widely known at all. Actually, this book combines several such stories: a story of the white man's injustice to native Americans, a story of oil and its impact on America, a biography of an early lawman and the founding of the FBI, but most of all a murder mystery that we may never get to the bottom of. This non-fiction history is shocking in its details of the corruption in business, government, law enforcement, and basic human dignity. It's not a story from long ago or far away. It happened in Oklahoma in the 1920s. 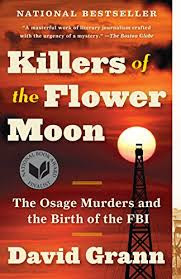 David Grann tells of the killings of the flower moon as a murder mystery. One after another the sisters and mother of Mollie Burkhart, an Osage Indian married to a white man, die, one shot in the head, one blown up in her home, one poisoned. Mollie herself becomes deeply ill, supposedly of diabetes. There's a spate of mysterious deaths on the Osage reservation in northeastern Oklahoma. What seems to tie them together is that the victims were all owners of "headrights", the oil royalties that were turning members of the Osage tribe fabulously wealthy. That it's a murder spree is clear to the Osage, a motive is obvious, even the likely suspects are known. What makes it maddening for the Osage (and hopefully modern readers) is that due to deeply corrupt local law enforcement and the state government's lack of interest in ensuring justice for native Americans, the killing spree seems to reach everywhere without end. Into this story steps former Texas Ranger and guy wearing a white hat, Tom White, working for the newly formed FBI, whose ambitious young director J. Edgar Hoover sees this case as an opportunity for his federal crime investigating team to make a name for itself (and Hoover). What follows is a fascinating story of detective work; of tracking down and arresting the bad guys; of working to get convictions in trials where the witnesses, judges and officials who can issue pardons and paroles are all deeply corrupt; and of the heartache and grief of families of the victims during this deeply disturbing "Reign of Terror." Tom White is undoubtedly the hero of this story, but even he doesn't get to the bottom of everything. Author David Grann, in researching this history as preparation for writing this history, uncovers more details himself that reveal just how widespread the crimes were. Grann is telling non-fiction. There are suspicions that can never be proven. There are records that have been destroyed that can never be restored. There are criminals who went to their graves without confessing. But what Grann can tell makes for a riveting history that ought to make all Americans ashamed that this could have happened in our country. And perhaps hopeful that even in such times, a few good men try to to do what's right.